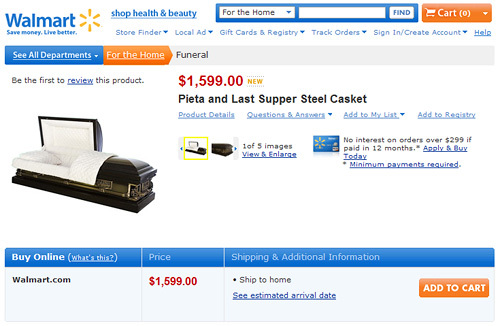 Yep, Walmart Now Sells Caskets Online | OhGizmo! To be perfectly honest I guess I really shouldn’t be that surprised that Walmart sells coffins and caskets on their website, but why are they listed under the ‘For the Home’ category? I’m pretty sure they have to be shipped directly to a funeral home, and in case you were wondering, they can’t accept a returned casket if it’s already been used due to FTC regulations. So forget about saving even more money on a refurb unit. I don't know if this is in bad taste or not. Next you'll see them on the shelves at Sam's Club. I'm trying to think of a joke for this golden opportunity but I got nuthin. This is just so dumbfounding I might just land me in one o' them things.. But on a lighter note, this just proves that Wal-Mart is beginning to feel the recession and is getting desperate. Next walmart will open funeral homes in their store. With quick cheap funeral services. Forget weddings at walmart, we now have funerals with full services. Go shop while we drain and fix up grandpa here. Not any crazier than costco's. Funeral costs are ridiculous, I think this is just one way to help out. When we mark your checkout receipt. that sad part is that this is probally a good thing. Funeral home prey on grief walmart prey to …. well i'm not sure. This answers where the bounding smiley face went. that sad part is that this is probably a good thing. Funeral home prey on grief walmart prey to …. well I'm not sure. This answers where the bouncing smiley face went.